1. We’re buying an free-range, local lamb from Wagon Wheel Ranch. Baltimore doesn’t have any farms that are really close to us but this one is about a 45-minute drive away so that’s really not bad. We found them at this great website – Eat Wild. We’re excited to be getting some meat that is grass-fed, natural, and local. Hip hip hooray! 2. In lesser news, I just realized that I had forgotten to post this. 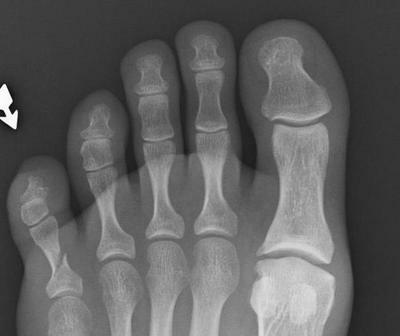 So here it is – the X-ray of my broken toe (from June). Just what you wanted to see on a Thursday evening, right? Enjoy! P.S. My broken toe from September is finally feeling better. So hopefully I’m done with broken toes for awhile. This entry was posted in cooking, health and beauty. Bookmark the permalink. I saw your comment on Farm Girl’s blog – has she responded yet? How great if she does. I think she’s the ‘cooking lamb’ expert I would turn to too. yuck. I’m sorry. I broke both of my middle fingers, one in kindergarten right before my school play perfomance and the other when I was 18 and had the two boys I nanny in the car … and slammed it in the door. They both never quite grew back the same!